Disclosure: I was provided a YMX tank and tee free of charge for the purpose of a blog review. All opinions are my own, and I am not obligated to give them a positive review. If I hated it, I'd tell you. People have been wearing art for centuries. Lines are blurred between fashion and art, art and fashion. Tattoos are an art form that you wear. 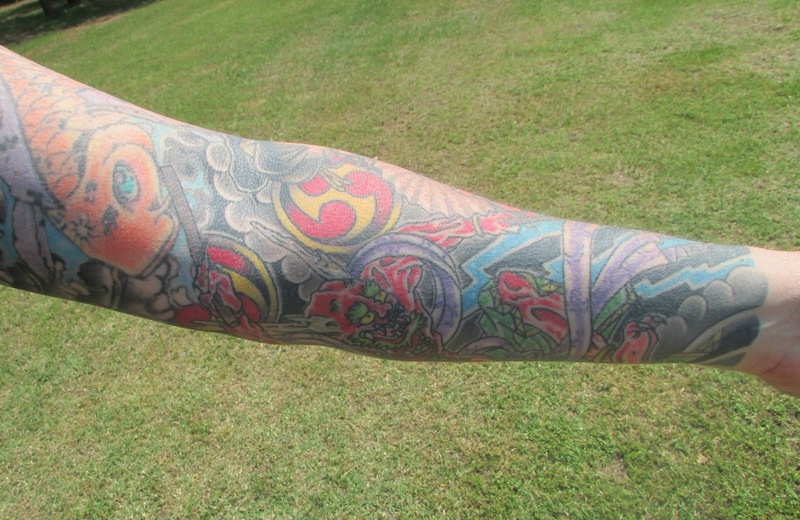 My husband has a full tattoo arm sleeve (among others). When people ask me if I have any tattoos (I don't), I usually reply that Hubby has enough for the both of us. A few years ago, our toddler neighbor was caught coloring all over her little arms in permanent magic marker. To the dismay of her mother, when asked what on earth she was doing, she innocently replied that she was just coloring her arms like my husband does. If he had art on his arms, why couldn't she? I love YMX who takes the art of tattoo and translates that art for those of us who are too chicken who aren't willing to commit to such permanency. The result is gorgeous authentic artful designs. Art and Fashion are not the only lines being blurred here. YMX also blurs the lines between athletic wear and street wear. Do you know what moisture-wicking means? It is a technology built into the yarn that pulls the moisture (i.e. sweat) away from your body to the outer layer to help keep you dry and comfortable. It means that after I run a few miles, I could run some errands without changing my clothes (Oh be quiet, you do it too). These pieces are great for layering and make a perfect transition from sweat to street, (OK, you can shower between, if you insist). I could easily wear these tops for working out or to wear to work. I love to work out in tanks. This one is light weight and breathable. It has the technology to keep you cool and keep you dry. I love the bright colorful design. I transitioned to street wear by changing out my shorts for black pants and adding a jean jacket. Now, I usually don't like to run with shirts with sleeves, they are usually too constricting. But this one was so stretchy and light weight, I barely felt a difference. The raglan sleeve style allows for easy movement. 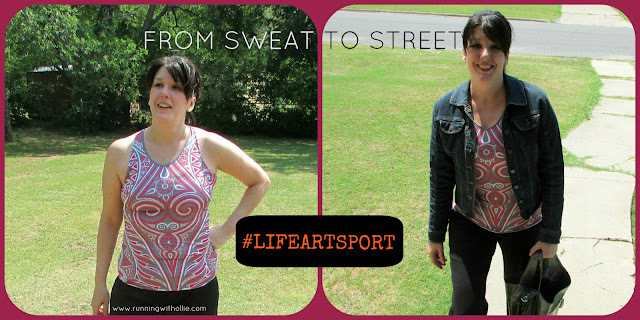 I went from sweat to street by changing my work out shorts for jeans and adding a short sleeve sweater. Can you tell this is one of my favorite colors? I already had a clutch to match! The fabric on the tank and tee both have a silk-like hand feel. The cloth is made from polyester and spandex, so it is comfortable and stretchy. It conformed perfectly to my body, but wasn't too tight or restricting. I love the design and the versatility of the YMX gear. I love that they function as work out clothes and trendy sports wear. This is definitely a high-end product in regards to quality, performance, and price. If you would like to check out some more of the awesome tattoo-inspired designs on YMX, you can check out their website here. 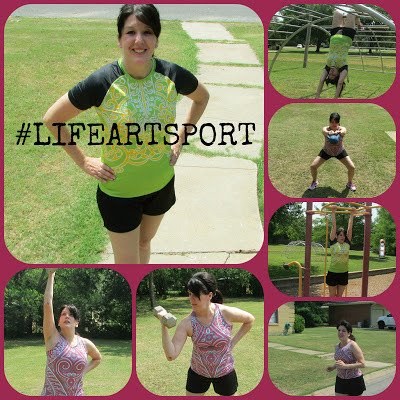 Do you wear work out clothes that transition to sports wear? 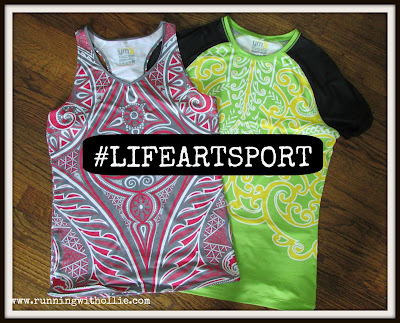 Do you mix art, fashion, and sport? Yay! I love my YMX tank too! 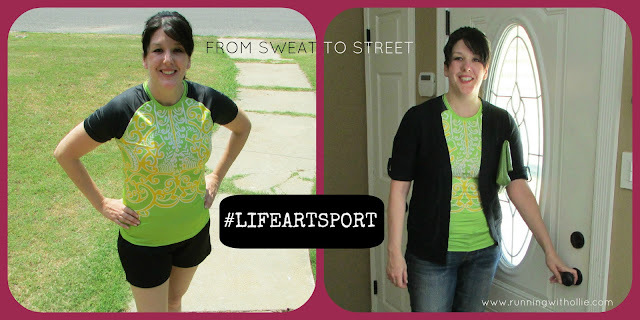 Love the way you did your review, of sweat to street--so clever :D And of course the tops look great! Wow, these are gorgeous! I went and looked on the site and a couple of those razorbacks are on my wishlist now! I have a tattoo on my shoulder blade, so I'm always looking for running gear that shows it off, these designs are awesome. I LOVE LOVE LOVE YMX!!! Gorgeous! I love YMX SO much! Love the designs. I'll have to cruise over to their site and check them out! Beautiful on you! I have claustrophobic arms also and wear tank tops at all times but that t shirt is nice! I won a beautiful YMX long sleeved shirt in a contest a while back and love it so much. The fabric is awesome. It's a very interesting concept where you have to balance objects perfectly on the field which are provided to you. Canon cameras are the loved of millions of photographers who want to explore more sides of photography. While recording, you can also change the audio levels by using the touch wheel, so if the audio is riding a little too high, you can change on the fly. Love!! Any clothes that can pull double duty gets a star in my book. And I'm glad you reviewed the t-shirt because I often don't like to wear t-shirts either because of the restriction. And this is no restriction, huh? :-) As a tattooed girl, I'm loving the art too!! These look great! I'm going to have to check them out, thanks. How cute! Work out clothes are just fun anyway, but these are super cute. :)Love the pictures too! Marketing generally look after a particular brand in a company, they are in charge of taking the brand forward in terms of the overall strategy this can mean PR/Above the line etc but also reporting to the MM, whereas the Marketing Manager looks after the marketing of brand(s) and in a big company that can mean multiple brands.